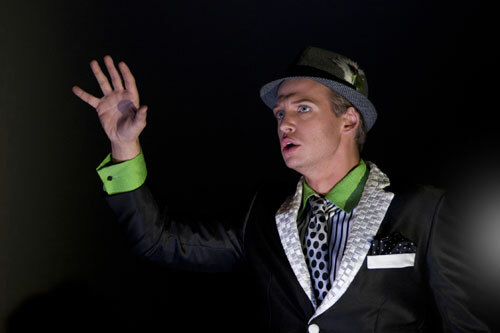 Baritone David Krohn wraps up his second season as a Young Artist with Don Pasquale, and afterward he’ll be sticking around Seattle to sing Prince Yamadori on the mainstage, in the season-closing production of Madama Butterfly. Today we chat with David and take a look back at the roles he’s taken on with Seattle Opera and the Young Artists Program, and find out what’s next for him. For more on Don Pasquale, which opens next week and features David as Dr. Malatesta on March 31 and April 6, visit our website. Sarah Larsen (Mercédès) and David Krohn (Dancaïre) in Seattle Opera's October 2011 production of Carmen. That’s one of the great things about being a performer, isn’t it? You get to try on so many different personalities. Sure, you get to take on all different kinds of characters, and you try to find things that are human in all of them because often in opera you’re dealing with people who are legendary. Look at the Orpheus and Eurydice that was just done on the mainstage. How do you play Orpheus? How do you play a god? How do you play Wotan? How do you play Madama Butterfly, a 15-year-old geisha, which is a role often sung by women in their 40s and sometimes even older? It’s the challenge of taking on a character. So what are the relatable traits you’ve drawn on for your recent roles? Well, Malatesta runs all these schemes just to help out his buddy. He's trying to help his friend Ernesto get married, so he pulls all these tricks on Don Pasquale. With Dancaïre, who is a smuggler, he’s just doing what needs to be done. It’s what he grew up with. If you ever talk to a criminal, they never tell you they did anything wrong, they feel justified in what they did. He’s simply doing what he knows how to do, which is smuggle goods. Albert, his pride has been wounded. Everyone’s pride has been wounded at one time or another. Everyone has been in love. Not everyone has been cheated on, but a lot of people know what that feeling might be like. From left to right: Andrew Stenson (Werther), David Krohn (Albert), and Sarah Larsen (Charlotte) in last fall's YAP production of Werther. In Don Pasquale, you have to sing both beautiful, long, lyrical, legato lines and staccato patter, as fast as possible. Which is harder? Which is more enjoyable to do? It’s always more enjoyable to sing long lines. While it may be sort of funny for an audience to get the staccato stuff in a comic opera, it goes against the natural instincts of the voice. The voice is meant to sing long legato lines, just by nature of what the instrument is. It’s what’s going to be the easiest and the most natural to sing, for sure. In last season’s spring YAP production of Don Giovanni, we got to see you in some memorable costumes—including bright green underwear. What is your look in Don Pasquale? What Stage Director Peter Kazaras and Costume Designer Deborah Trout have tried to do for this production is to create an atmosphere and a mood of the 1950s and 1960s—Fellini, Rome, La Dolce Vita, that kind of thing, where the characters are very sleek and stylish. I also have a big wig that is going to add about four inches of curls to the top of my head, so I’ll probably be about 6’5” or 6’6” by the time I take the stage! But I think it’s a very attractive costume, and Deb has some really beautiful ideas. What was really funny about last year’s Don Giovanni was the suit I wore. They tailored it perfectly to my body; it was a tight, European-cut, gorgeous, sleek, shiny black suit that looked like a $2000 suit. I spoke to Costume Designer Candace Frank and said, “Look, this suit is beautiful, I want to buy it from the Costume Shop when we’re done,” and she said, “Absolutely!” And then I got to the first dress rehearsal and I realized to make it work for the stage they had put on these giant, white embroidered lapels and added big detail work all over it. So I had to pass on it. 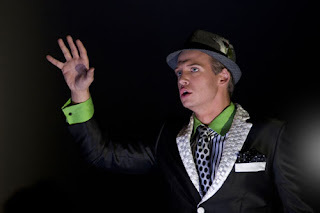 David Krohn as Don Giovanni in the Young Artists Program's 2011 Don Giovanni. What’s next for you, after you leave Seattle this spring? When I leave here, there are a few things up in the air that I can’t announce one way or the other just yet. But as far as concerts go, I’m doing my debut with the Calgary National Symphony coming up around Thanksgiving 2012. I’ll be doing a pops concert with Jack Everly, of 1940s radio music. That will be really fun—a lot of Cole Porter, Irving Berlin kind of stuff. Then I’ve got some concert work in Virginia through 2013. I’m doing a program of Yiddish art songs that I’ve been getting off the ground, to try and bring Yiddish music from my background. I grew up in the synagogue and my father is a rabbi, and Yiddish was the language we spoke around the house. A lot of these songs are dying out; if people know them, it’s usually people of an older generation. I’m trying my best to keep this rich heritage of art songs going for a new generation.